An exceptionally stylish supper club, civilized speakeasy, a sophisticated saloon. Each of these "personae" is housed in a soaring two-story interior distinguished by a gently curving mahogany bar, fluted columns with ornate capitals, stunning original art, plush banquettes, cozy booths, starched linens, glittering glasses, and polished flatware. 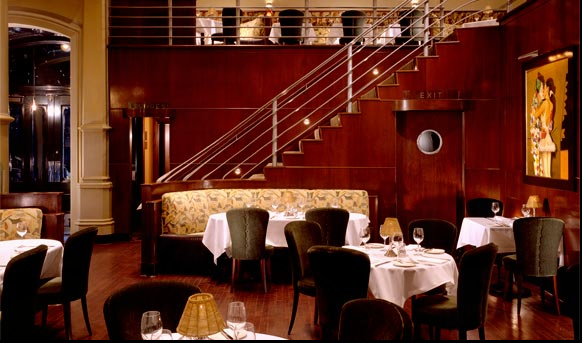 Overall, the ambiance is pure 1930's and 1940's - tasteful art moderne reminiscent of the glory days of Cunard and French Line ships. Fashionable and glamorous are the hallmarks. Trendy is simply not a part of the BIX culture. The clientele at BIX ranges from San Francisco movers-and-shakers to "savvy travelers" - owner Doug Biederbeck's term for the many diners in the know from out of town who patronize his establishment. All of them step from the featureless alley into another world - a world of superb cookery and libations, of sparkling service, of stylish nostalgia, of polished live jazz. That world is BIX. For more than 20 years, BIX has been the venue of choice for spirited and sophisticated private events. Because of its dramatic and glamorous decor, exceptional service and attention to detail, the restaurant has been the setting for many memorable events.